Q. How much wood can a woodchuck chuck? Here in Vermont we have our share of birch trees. I learned last week that “birch logs” have become a popular seasonal item in some metropolitan areas of the country. My brother-in-law David Friedland shared this photo he took recently. 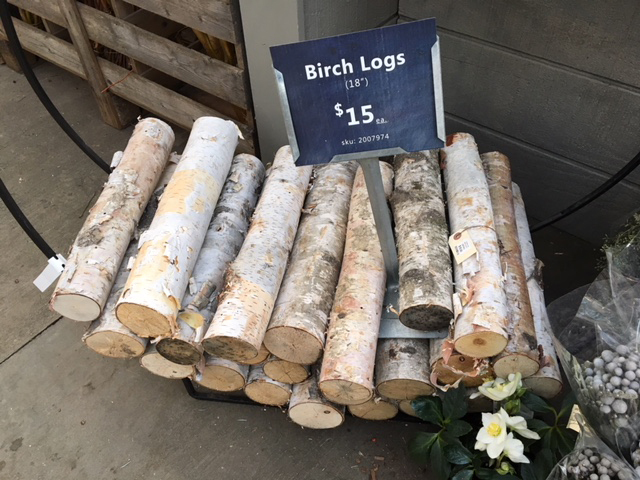 Birch logs for $15 EACH!?? Oh my. It should go without saying, I would much rather spend my retirement check on one of your lovely painting, Peter! 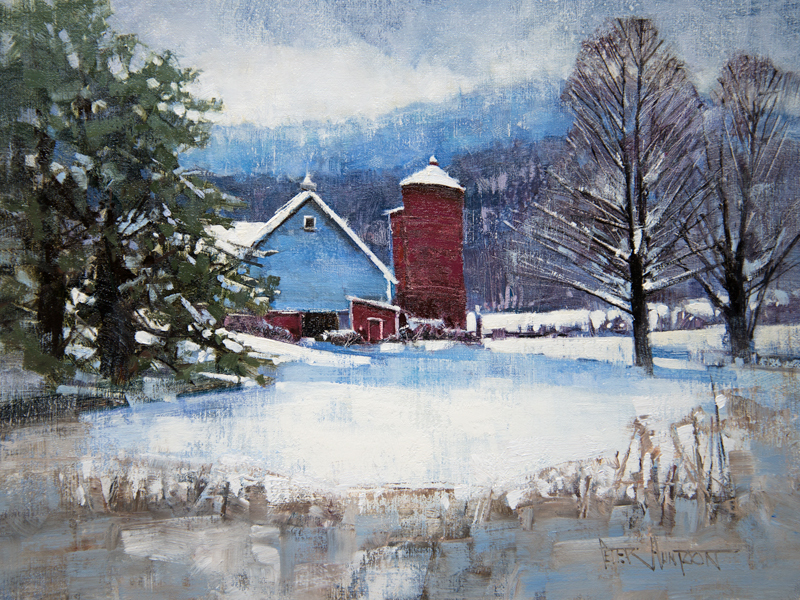 Red barns are my favorite but this blue one is especially exquisite trimmed in white snow and red silos. I need new Christmas cards. I’ll take a pack of this image! Simply lovely. The peace of the Season. Just getting around to decorate, and your painting would fit in perfectly!!! There is no place like Vermont! Beautiful,I have a lot of downed birch trees,I could get rich! Thanks Olivia, lock your woodshed! I love the photo of the birch logs. I have three birch logs that are over 40 years old given to me by my Grandmother from my aunt’s farm in Wisconsin, when I got my first home with a fire place. I use them strictly for decoration! My favorite so far! My bucket list dream since 2nd grade has been to go to Vermont at maple sugar time. 58 years later and it is still my goal. That dream was inspired by my teacher reading us a story from our reader about maple sugar time with pictures reminiscent of your winter paintings and buying each student a maple sugar leaf candy from our local fancy candy shop. Still can’t pass by any maple sugar candies without that memory. What a great example for painting snowy landscapes. Today I said to my students that white is not really white in the context of a painting. In Duisburg big snowflakes are tumbling down and so all students wanted to paint snow. The feelings of the childhood and Christmas came immediately. Next week l will show them some of your great winter paintings and the connected photos. The colors of your different whites are so obvious and lively that they can learn very much. Even when the snow is already melted they will remember the winter themes by regarding your beautiful icy landscapes. Thanks Doris, it will be my honor. Absolutely breath taking. 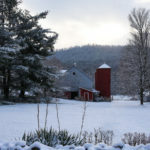 Very very Vermont! Barns are what I miss most about living in Florida. Love your paintings. I watch for your wonderful New England paintings always. Love them. I treasure my New England roots and ethics. What a beautiful painting. I just love it. What power the many colors of snow have to portray the peace and beauty of a winter scene! Beautifully painted, as always, and scarcely a flake of “white”! I have always loved barns….especially old ones. Some of my best childhood memories were spent on my aunt and uncle’s farm. 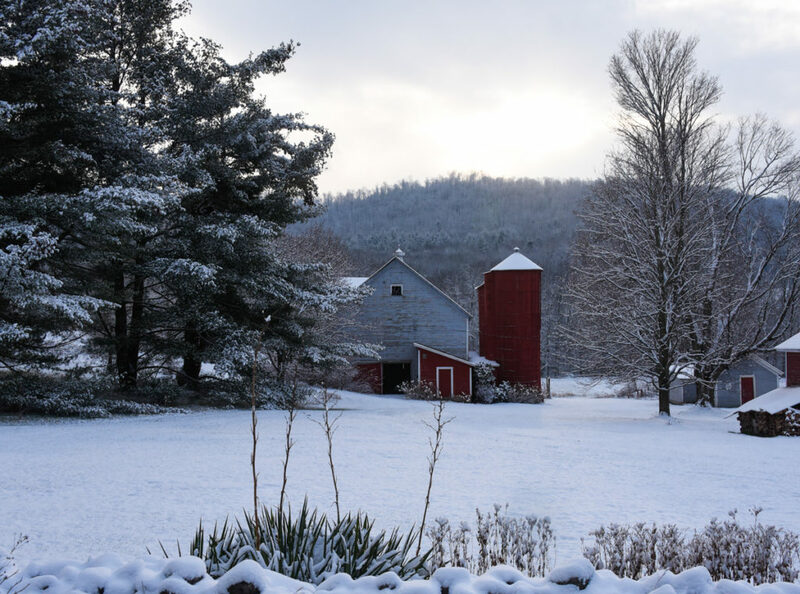 This barn looks so much like their barn….triggered such special memories when I saw it. Love it!! Nice painting! I love barns. Made me think of the family reunions at your Uncle Bob Scott’s farm. They always let us kids play in the barn. Lots of fun. Great memories Chuck, thanks and Merry Christmas!